The San Diego region’s climate is likely to experience significant rises in temperatures, sea level, dryness and conditions that increase wildfire potential if climate change is left unchecked according to a new state report published Monday. The state’s Fourth California Climate Change Assessment is the first since 2012 and details the extreme damage and cost in both money and lives climate change in California could cause over the next century. 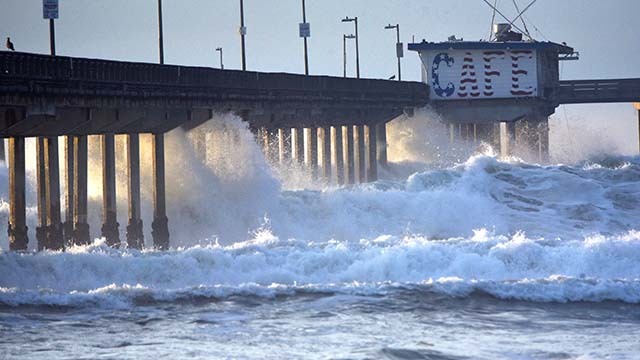 It is the state’s first climate assessment with regional reports to accompany the main report and includes a report by researchers from Scripps Oceanography and San Diego State on the greater San Diego area. Temperatures in San Diego are expected to increase five-to-10 degrees and sea levels are expected to rise roughly three feet or higher by 2100. Researchers also expect precipitation events to increase in volatility, with longer durations of drought culminating in more violent precipitous activity. The most devastating result of increased climate volatility could be an increase in large catastrophic fires according to the assessment. General risk of wildfires is likely to increase as the climate warms, but increases in the frequency of Santa Ana wind events and drier autumns are likely to exacerbate the already higher risk of wildfire damage. Wildfire damage caused $12.6 billion in insured losses and killed 60 people in 2017 according to state Insurance Commissioner Dave Jones. The report found that the average area burned across the state by wildfires could increase by 77 percent by 2100.